I would like to start this review off a bit different than usual due to the fact when I was asked to review this product I had never actually heard of the manufacturer before. That’s not always a bad thing as the industry is huge so obviously from time to time a gem of company can slip through. Marmitek is a Dutch company who seem to be focused primarily on home entertainment and home automation systems. A quick glance through there website and you can instantly notice that they also seem to be focused on wireless technology which we all love. Before we begin here is a short advertisement from YouTube I found on the speaker. 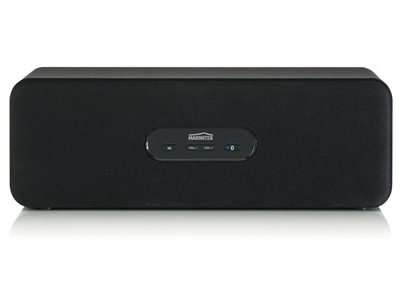 The BoomBoom 230 could easily be described as a speaker for those who like minimalist design. The housing is rectangular shaped with rolled edges that give it a more expensive look than it actually is. The housing itself is comprised of wood with a plastic covering, cloth grill upfront and a screwed on plastic rear plate. I would like to say at this point the plastic in no way makes this speaker look cheap but granted it is still plastic. The speaker is finished in Matt-black color that I feel really suits the speaker and helps give it that ” I’m not a budget Bluetooth speaker” look. 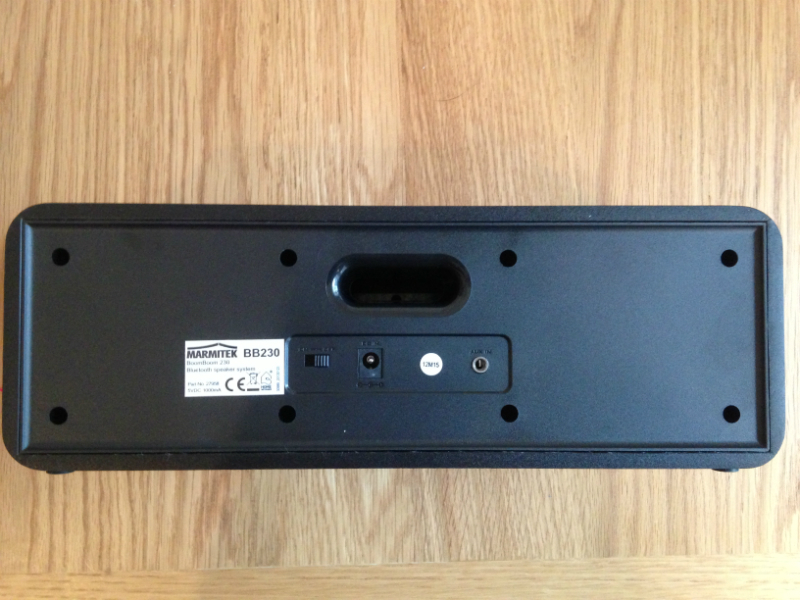 The front of the speaker hosts a small, very discreet control panel again highlighting that minimalist look. On the front panel you get volume control, play/pause button and the Bluetooth connection button. On the rear you have your power on/off switch, power port and a 3.5mm audio port. Now that we have the design out of the way lets talk about the sound quality. 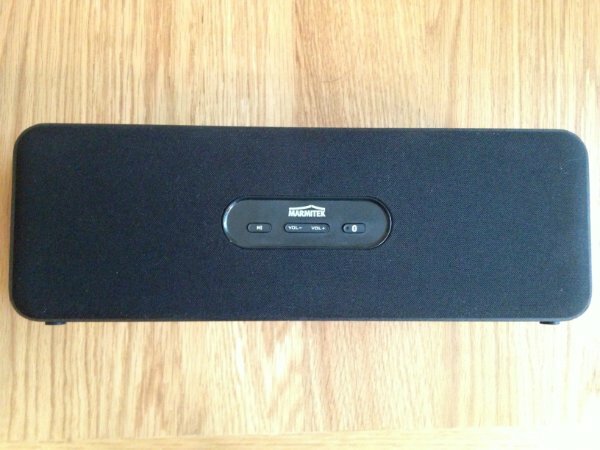 The BoomBoom 230 is a relatively cheap speaker at £43.99 so I wasn’t expecting this to be as good as my Sonos speaker or anything near that but after a quick play I was surprised. The BoomBoom manages to produce some pristine sounding top end, and open, clear upper mid-range. While the speaker does attempt to put out some mid and low bass it isn’t going to give you that in-room sensation we often look for. Don’t get me wrong some other Bluetooth speakers we have looked at or that I have personally owned suffer from a poor base response and sound totally thin, but the base here is the perfect amount to stop that happening. The volume range of the BoomBoom 230 is also worth mentioning. Having it down low or cranked up to the point the neighbour is ringing your door bell makes no difference, you still get a great level of clarity. While reviewing the speaker my wife came up with idea that we used the speaker while watching a movie. This also seemed like a strange idea to me but we have a small flat-screen in our kitchen that the audio is great on so I went ahead and tried it. I hooked my phone up to the TV with my OTG cable, put XBMC on and started the movie. Instantly my little flat-screen had been reborn in the audio department, watching movie’s while eating dinner was now very pleasurable. This is the one are that let’s Marmitek down. There is no equalizer settings, LCD or built in battery to be found here. The one thing that I would have loved to see added was a radio tuner especially with the price tag. However the Marmitek features what can only be described as rock solid Bluetooth connectivity. You can have up to eight devices stored at any one time. If you add a ninth it just knocks the oldest one off the list. I own a lot of devices with Bluetooth capabilities and they all connected to the BoomBoom 230 with ease. 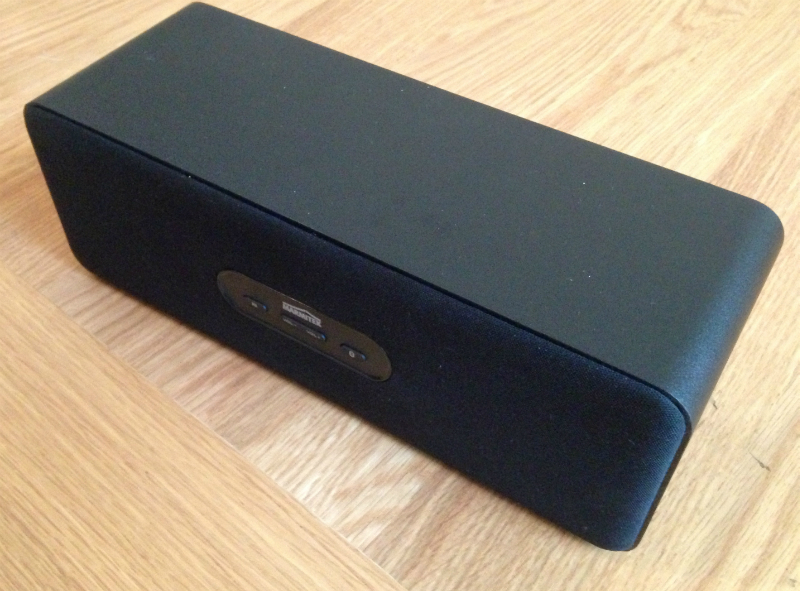 The range is absolutely fantastic, playback suffered no interference at all as I took a stroll around my house. As mentioned earlier the BoomBoom 230 features a 3.5mm audio input on the rear but it is worth pointing out using this obviously disables the play/pause button on the speaker. Setting up the BoomBoom 230 is a breeze. This is very important to me as some Bluetooth speakers I have reviewed and owned seem to make the process unnecessarily hard for the user. To get the BoomBoom up and running all you have to do is hold the Bluetooth button in on the front panel to make it discoverable. After that it’s just a case of searching for the BoomBoom on your Bluetooth device and it will connect with ease. As I have already stated every Bluetooth device I tried whether it be Android, iOS or a streaming media device, they all connected with ease and played my music seamlessly. If you would like to switch to another device it couldn’t be simpler. Just tap the connect button once to disable current device, then just follow the same steps as above to get new device connected. If you want you can use the 3.5mm cable supplied with the speaker to connect your device up with ease. The BoomBoom 230 from Marmitek is reasonably priced in regards to the quality you will receive for your money. As I have said the feature list is not great but it does seem that Marmitek focused on making the audio and Bluetooth as good as possible rather than worry about LCD displays and a radio tuner. Also don’t let no radio tuner put you off as nearly every smartphone on market has one built in so just hook it up to the BoomBoom 230 and their you have it. On a personal note for the price I feel you would be hard pushed to find another speaker that will deliver the quality of sound that you get with BoomBoom 230. This speaker would fit perfectly in a busy household and allow the whole family to connect with ease. Thanks to MoneySupermarket for the opportunity to review this product.